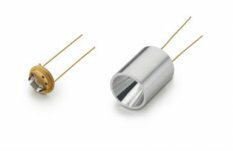 The IR-3X series is a coil-wound, supported IR Source, mounted on a TO-5 header. It is appropriate for use in laboratory or field instrumentation due to its long life and stable properties. At steady state, the coiled filament operates at ~925°C when powered with 4.2 watts for the standard IR-30 and at ~950°C when powered with 4.2 watts for the IR-30K. The IR-30 uses a high stability wire whereas the IR-30K uses Kanthal resistance wire for operation at higher temperature. Apart from the wire used, the IR-30 and IR-30K are identical. It can be pulsed up to 1 Hz with a larger power input. When operated at 1 hertz, 50% duty cycle with 3.5 volts, 7.1 watts, the output is a well-defined saw tooth with approximately 32% modulation depth. For higher modulation speeds, the pulsable sources should be considered. Operation in a controlled or sealed atmosphere is not required.